Christmas in Nevada. 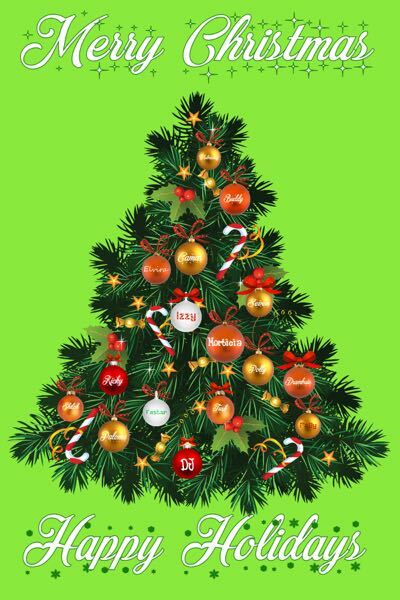 Here are the Ibizans, but I think we are sorta missing Santa, heh? No wait, I know, it's Mugabe! He is off to the side digging a hole which is what the boys are looking at! Here are Chaos, Mugabe, Dreamer, Frosty & Commander with Santa. Here is Chaos, Dreamer, Frosty, Mugabe, Commander and Santa. This is one of my last pictures of Dreamer. He passed on to Rainbow Bridge on June 26, 1998 at the age of 13 1/2 years old. 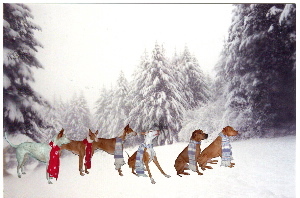 Here are the boys pretending to be Santa's reindeer! 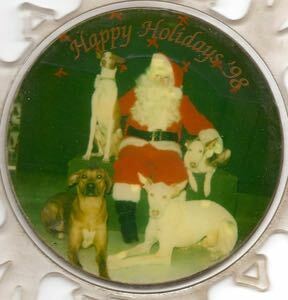 Here are Chaos, Mugabe, Frosty & Commander with Santa. 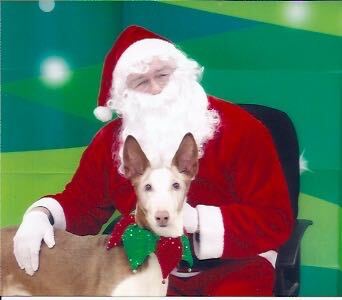 This is the last Christmas Commander was with us. He crossed over Rainbow Bridge on March 3rd, 2000. This was also the last Christmas that Cody was with us. He found new parents the summer of 2000 who needed him for a companion for their Lab mix. Here are our kids in our backyard (Kenosha, WI) looking for Santa Claus! They just seen some Reindeer running in the field next to them. From left to right: Mugabe, Chaos, Kito, Madja, Astro & watching from behind to make sure Santa doesn't sneek up on them, Frosty! Getting the boys (and girls) to lay on "snow" this year was difficult. Frosty became tired waiting for Santa. 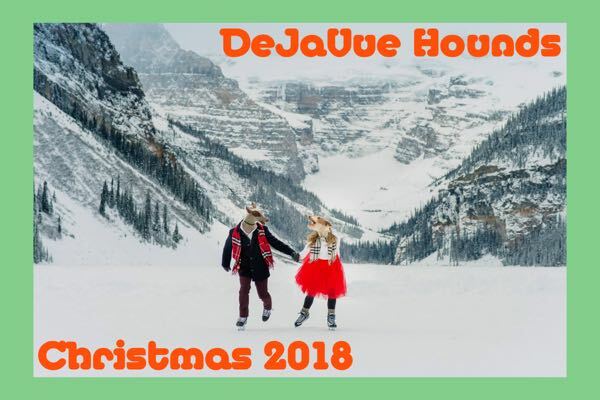 Here is our holiday picture for this year. It is (backrow) Chaos, Mugabe, Frosty, Kito & Madja. In the front are Phinny & Astro. Santa came to visit the kids & pose for a picture. Chaos & Astro are missing because they crossed Rainbow Bridge, this past October. 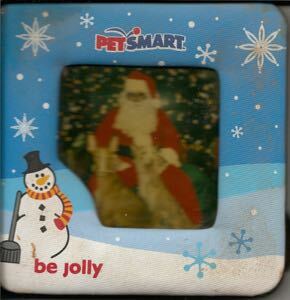 Madja & Phinny are sitting on either side of Santa. 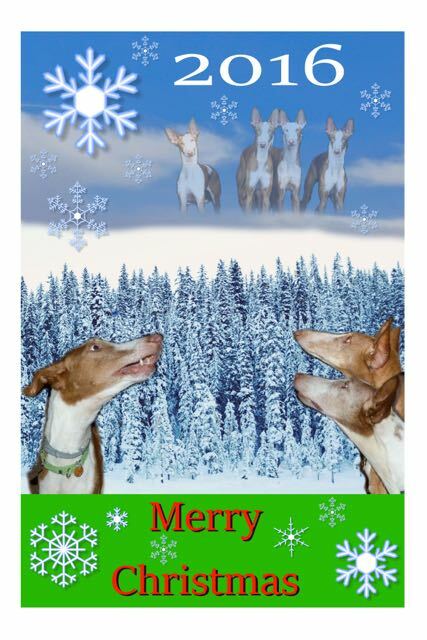 Mooman, Frosty & Kito are in front of them. 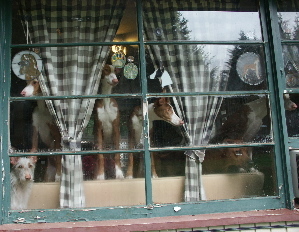 The kids (Phinny, Data, Deanna, Jean Luc, Mugabe, Madja) are watching for Santa here in Washougal, WA. Frosty & Kito are at the door on the other side of the room, so you do not see them in the window. Here are the kids trying to be good, as they know Santa is coming. On the couch is Frosty, Kito and Mugabe. In front of them is Jean Luc, Deanna, Phinny, Data & Madja. You can see Jean Luc is hopeing Santa doesn't know about the few times he hasn't been good. Data & Madja are bord of waiting. Frosty, (who is 13 1/2) is going to sleep until Santa shows up. 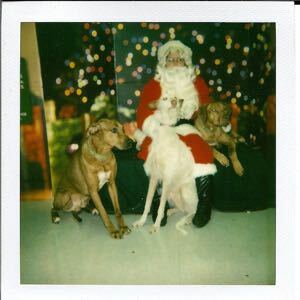 Santa shows up, and stayed long enough to pose with Madja and her pups (Data, Deanna, Jean Luc). 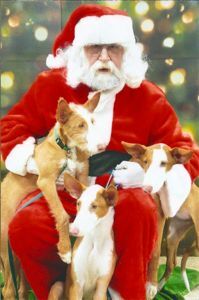 Madja told me she closed her eyes when the picture was taken as she didn't want to see what the pups were going to do next... Poor Santa, the pups took his hat, pulled on his beard, and ran off with his gloves! Good thing Santa loves animals and everyone! 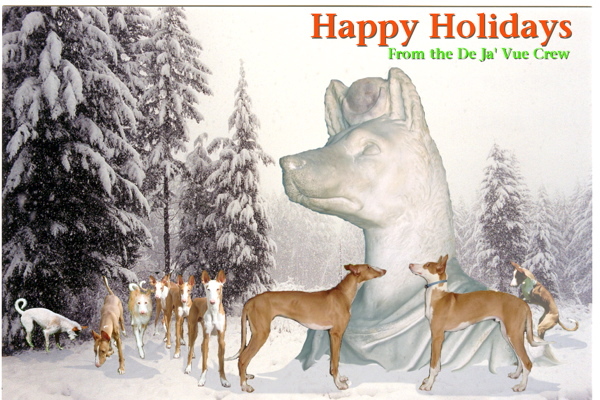 Phinny, Deanna, Kito, Data, Jean Luc & Mugabe are looking up at the Christmas star. You will notice that Madja and Frosty are missing this year. Madja crossed over Rainbow Bridge on June 8th and Frosty joined her on October 21st. The holidays seem empty this year without them. 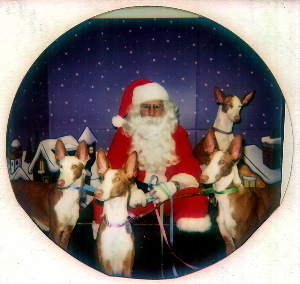 Here are Mugabe, Phinny & Kito with Santa. 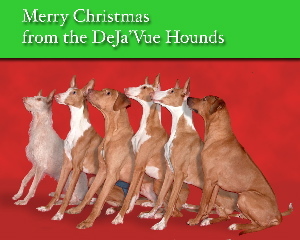 The kids (Phinny, Deanna, Jean Luc, Data, Mugabe, Kito) are watching for Santa as the snow is coming down in our yard. 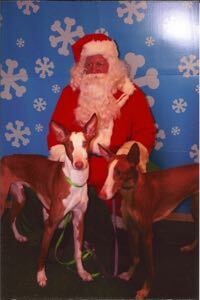 Here are Paloma & Jojo with Santa. 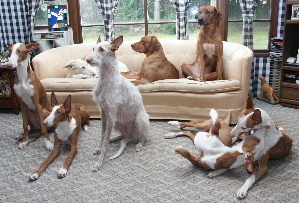 Here are our dogs, my best friend Tomme's dogs, and the litter of puppies that Deanna had in August. Notice that Madja is looking down at them from heaven. Here are Ricky & DJ with Santa. 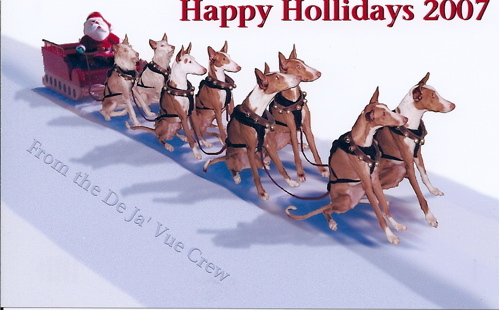 The kids (Phinny, Jojo, Jean Luc, Data, Deanna, Paloma, Ricky & DJ) are filling in for Santa's reindeer this year. This past October 20, Mugabe & exactly 2 weeks later, Kito crossed over Rainbow Bridge. 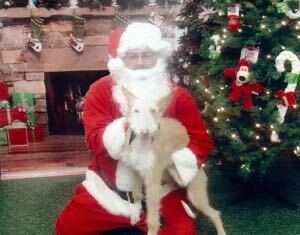 Buddy got to meet Santa today. He never heard of him until a few days ago, as he was born December 27, 2007. Here are Phinny, Jojo, Deanna, Data, Jean Luc, Paloma, Ricky, DJ and Buddy building a snow dog in our backyard. 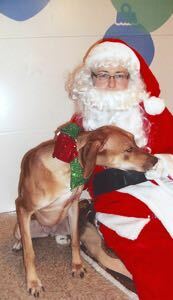 Drambuie got to meet Santa today. He never heard of him until a few days ago, as he was born November 20, 2008. 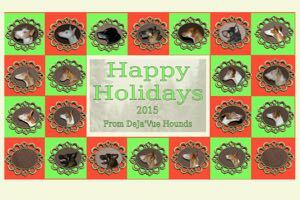 Here are Phinny, Jean Luc, Data, Jojo, Deanna, DJ, Ricky, Tickle, Buie, Paloma, Buddy and Shiloh as the 12 dogs of Christmas. 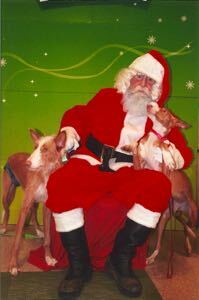 Santa was not happy meeting Gwen, Fester & Morticia. Here are our dogs, from the top down. Madja is in the star. First row- Deanna. Then Jean Luc & Data. DJ, Buddy, Paloma. Ricky, Phinny, Jojo & Tickle. Shiloh, Fester, Morticia, Gwen & Buie. Santa didn't want Gwen on his lap, even though she is wearing britches. She just became a "big girl" a few days before this was taken. Santa is really thrilled to have Wednesday and Gwen by him for this picture. Buie didn't want to have his picture taken with Santa, so he hid behind the Christmas tree. Little did he know that is where the camera was! Elvira got to meet Santa this year. She is just 14 months old since she was born on Halloween last year. 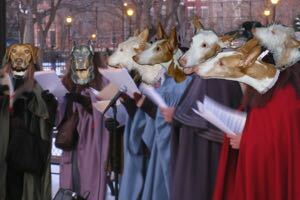 Here are Elvira, Drambuie, Phinny, Jean Luc, Data, Deanna, and Jojo, singing Christmas carols. 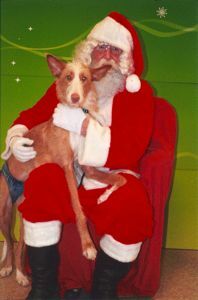 Shiloh got to meet Santa this year. At 7 years old, he didn't think it was a big deal. 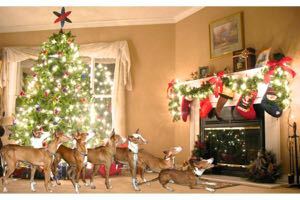 Here are Buddy & Paloma with their pups- Morticia, Gwen, Fester, Wednesday, & Izzy, waiting for Santa to come down the chimney. Phinny, Jean Luc, & Data are not in the picture as they died earlier this year. 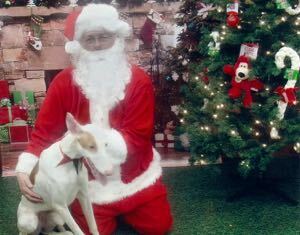 Camas got to meet Santa for the first time this year. Last year she was too young & still with her mama & littermates. Camas didn't like this idea at all. 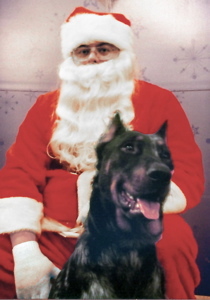 Seven was so excited to meet Santa this year, even though Camas told her not to trust him. She didn't listen to her. 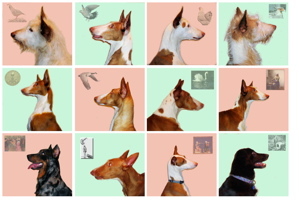 Here are all of our dogs. Yes, there is a lot of them. Seven, Camas, Shiloh, Glitter, Elvira, Drambuie, Morticia, DJ, Paloma, Tickle, Jojo, Deanna, Buddy, Ricky, Fester, Turk, Polly, Gwen, Wednesday & Izzy. 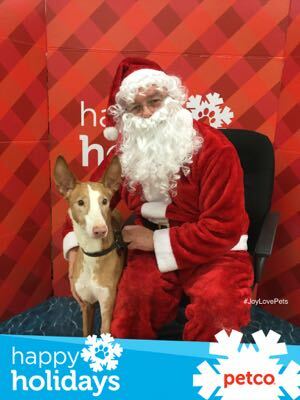 Tickle was so excited to meet Santa... She heard about him for so many years & it was finally her turn to meet him! This was a sad year for us. The last of our first litter of Ibizans, Deanna, has crossed to the bridge. 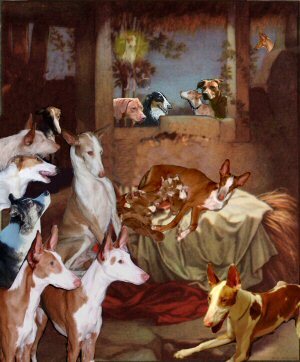 Here are Tickle, DJ & Ricky looking up to heaven at Madja, and her pups, Deanna, Jean Luc & Data. 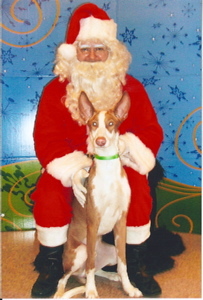 Izzy got to meet Santa this year. 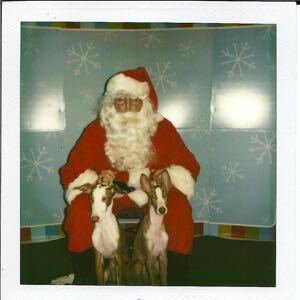 At 7 years old, he thought to see Santa & all the attention he got was lots of fun! This year's tree had the names of all of our dogs written on the ornaments. 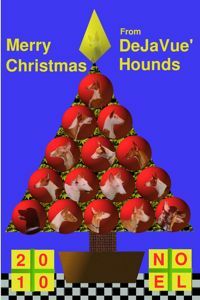 Sadly, Jojo & Tickle are not in the tree as they died earlier this year. 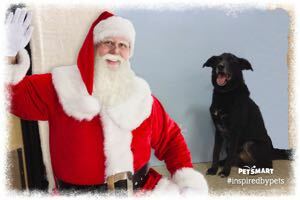 Ilea got to meet Santa this year. 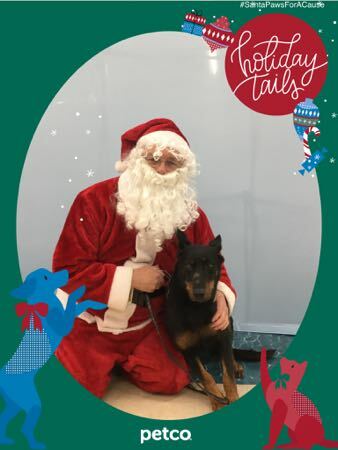 At 5 years old, she never got to meet Santa as she just joined our pack this year! This year's card has just Camas & Seven are skating on the ice. Sadly, Paloma & Ricky are not iwith us as they died earlier this year.